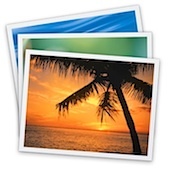 Need to move your iPhoto library? No problem, it’s easily done by a two-step process – first you need to physically move or copy the picture library to the new location, and then you have to tell iPhoto where the new location is. This is all really easy to do on the Mac, and it works to put your iPhoto library onto an alternate volume with more storage, particularly nice if you’re feeling the disk space pinch in OS X.
Let’s jump right to to it and learn how to relocate the iPhoto library. This is basically a two step process; moving or copying the iPhoto library to the new location, and then pointing to that new location from iPhoto app. This is typically instantaneous but sometimes there’s a slight delay as iPhoto reads the library file again. 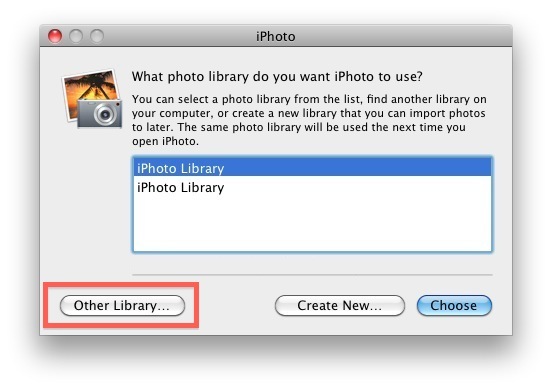 Now iPhoto will use the library you have specified in the new location, just be aware that if you chose an another hard drive and then launch iTunes without that drive connected, your images won’t be available. This tip from one of our commenters is a lifesaver for anyone working with limited hard disk space, since it makes a lot more sense to store things like iPhoto and iTunes libraries to external drives rather than take up disk space with infrequently used media files. I’d be careful doing this – I moved my iPhoto and iTunes libraries onto my NAS and had problems with my Macbook registering the locations. Generally not a problem but I had to keep directing iPhoto to the correct library location and not all of my music synced every time from iTunes. Be sure you have the NAS mounted all the time and this works fine. I share my iTunes folder between 3 Macs by using this format, iPhoto and iMovie shouldn’t be any different. I use iPhoto Library Manager, which is really good. It lets you have multiple Libraries, remembers where they are stored and even automates copying photos between them. It also assists with syncing iPod photos. « iPhone 5 Reservations Available Now in EU, Pre-Orders Coming Soon to USA?